While Shaun White Snowboarding wasn't the best game of last fall, it is one of the best selling games. The multi-platform game sold 3 million copies. You know what that means? More Shaun White Snowboarding. Just listen to Ubisoft honcho Yves Guillemot, "You can expect more Shaun White in the future." Don't get excited, it's a given. There will be more. Yay? 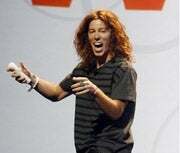 As website GameSpot points out, Ubisoft has not yet slated a Shaun White sequel for its current fiscal year, which runs through March 31, 2010.